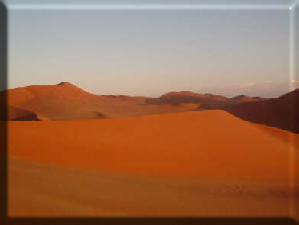 The tallest red sand dunes in the world, this is one of the best landscapes in Namibia, offering incredible colour contrasts and amazing photographic opportunities. 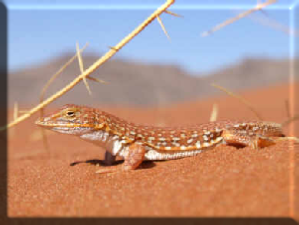 Take a closer look at the abundance of small life, which boggles the mind as to how the numerous creatures can survive in this harsh Namib desert. This is the end of the Tsaugab river, 55km from the Atlantic ocean, which sometimes after heavy rainfall turns into a true water filled oasis. Sossusvlei is a MUST visit in Namibia. · Drive to the park entrance gate 200m further where your permit is checked, and proceed into the park, (this is a 60km tar road, for reasons of dust, until the 2x4 Parking Area). Take care as often animals stand on or cross this road. 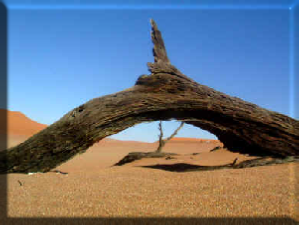 · 45km from Sesriem maybe climb Dune 45, but I rather recommend to proceed onwards to the 2x4 Parking area. 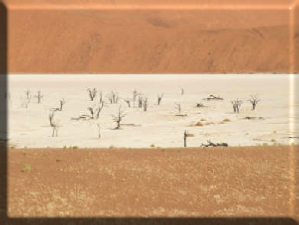 If you have a 4x4, and know how to use it, then drive the last sandy 5km to the Deadvlei parking area. 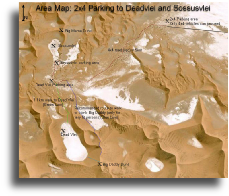 · Either walk or drive the 400m to Sossusvlei (most people drive if they want to climb “Big Mama” dune at Sossusvlei). Climb “Big Mama” even if just a quarter of the way, the view up there over Sossusvlei is well worth it. The whole dune takes a person of average fitness about 15 to 20 minutes to climb. Very fit people take about 10 to 12 minutes. · Run down the steep side for fun, taking care to put your camera into a preferably waterproof bag to protect it from sand grains. · Empty your shoes of sand (I always say “Please leave the dunes where you find them”) and head back to the car or shuttle. · Drive back through the 5km 4x4 Road, and the 60km road to Sesriem, buy a refreshment and head on to the 4.5km road to Sesriem Canyon. · Enjoy the canyon view from the top, and head into the canyon to explore (takes about 40minutes for going in, exploring a bit and coming out again – it is a small, but impressive, canyon). · Proceed onwards to accommodation. 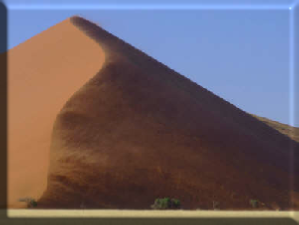 · Try to buy your permit before the day you go into Sossusvlei, this saves time of standing in the Q at the Sesriem permit office, and therefore enjoy the dune shadows for longer in the morning. 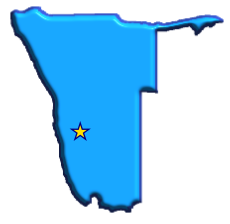 Permits can be bought at NWR (Namibia Wildlife Resorts) offices. 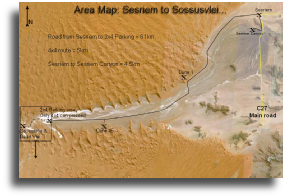 · The trip from Sesriem to Sossusvlei, and back to the Sesriem Canyon rarely takes less than 5 – 6½ hours, including a climb up “Big Mama”, at least 2 hour longer if you climb “Big Daddy”.